and used as though it were graphite. 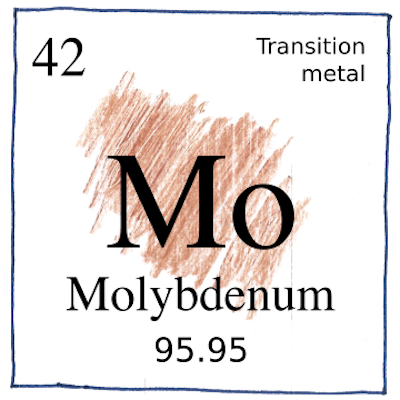 distinguished it from lead ore in 1754.
to produce molybdenum metal in 1781.
that makes strong alloys with steel. and in enzymes that fix nitrogen for some bacteria. and as molybdenum disulfide for solid lubricants. and as molybdenum disilicide in high-temperature ceramics. replaced tungsten in some steels in World War I.
I had always placed the accent on the second syllable, but now I must try to put it on the third. Diamond used to be the hardest form of carbon; now, the honors go to carbyne, or fullerite, or Q-carbon.